The SweetWater Music Festival has unveiled a new logo mark along with updates to other components of the “SweetWater” brand. This new look is being launched as the Festival moves into its 14th season in 2017. It represents not only where SweetWater sees itself today but also where it is looking to go in the near future. The new logo mark was created after extensive consultation between members of the Board of Director, the Fundraising Marketing Committee, and Artistic Director Mark Fewer, and Festival Manager Paul Eichhorn. Feedback provided by Board Members, the Artistic Director as well as SweetWater supporters at a January initial strategic planning session were also taken into consideration. The Festival Manager compiled this information and created a detailed creative brief for Innisfree Design. The firm was approached to create the new SweetWater look. The creative goal was to develop a logo mark that provided the public with a shorthand version of what SweetWater is all about. 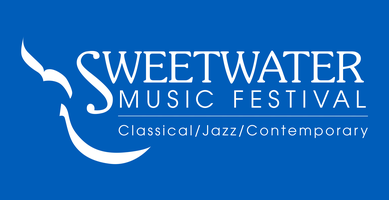 The final logo mark not only incorporates a violin (a key part of the Festival and Artistic Director Mark Fewer’s instrument) but also features a type line to note the music genres performed at SweetWater. The design of the logo and word mark can also be easily adapted for various events and activities. This is just the first of many projects that Innisfree will be working with SweetWater on over the coming months. The design firm will also collaborate with the Festival Manager to incorporate the new branding into promotions for SweetWater 2017 coming up in September. SweetWater is fortunate to have Innisfree as our Graphic Design Partner for these projects.